Our knowledge of human cognitive architecture has advanced dramatically in the last few decades. In turn, that knowledge has implications for instructional design in multimedia contexts. In this chapter, we will analyse human cognitive architecture within an evolutionary framework. That framework can be used as a base for cognitive load theory that uses human cognitive architecture to provide testable hypotheses concerning instructional design issues. Human cognition can be characterised as a natural information processing system. The core of such systems can be described using 5 principles: (a) information store principle, (b) borrowing principle and reorganizing principle, (c) randomness as genesis principle, (d) narrow limits of change principle, and (e) environment organizing and linking principle. These 5 principles lead directly to the instructional effects generated by cognitive load theory. 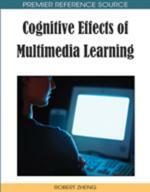 Some of these effects are concerned with multimedia learning. The particular ones discussed in the chapter are the split-attention, modality, redundancy, element interactivity, and expertise reversal effects. Geary (2007) divides knowledge into biologically primary knowledge that we have evolved to acquire easily and automatically and biologically secondary knowledge that relies on primary knowledge but that we have not evolved to acquire. Examples of activities driven by primary knowledge are listening and speaking our first language, recognising faces, using general problem solving techniques and engaging in basic social relations. We have evolved over millennia to acquire massive amounts of knowledge associated with these activities easily, quickly and without conscious effort. We can acquire biologically primary knowledge simply by being immersed in a normal human society. Explicit instruction is unnecessary. In contrast, biologically secondary knowledge tends to be associated with a more advanced stage of development of civilization. It has only been required since the rise of civilisation and so we have not evolved to acquire specific examples of biologically secondary knowledge. We can acquire such knowledge using biologically primary knowledge but it is acquired relatively slowly and with conscious effort. In contrast to biologically primary knowledge, biologically secondary knowledge requires explicit instruction and conscious effort on the part of learners. The bulk of knowledge acquired in educational institutions such as schools consists of biologically secondary knowledge. There is a basic logic associated with the acquisition of biologically secondary knowledge and that logic is identical to the logic that underlies the processes of evolution by natural selection. Both are examples of natural information processing systems (Sweller & Sweller, 2006). There are many ways of describing that logic. In this chapter we will use five basic principles. In order to function, natural information processing systems require a massive store of information used to govern activity. In the case of human cognition, long-term memory provides that store. The well-known work of De Groot (1965) and Chase and Simon (1973) on the knowledge chess masters have for board configurations taken from real games provides evidence for the importance of long-term memory for most facets of cognition, including problem solving. A genome provides the same function for evolution by natural selection. Acquiring a massive store of information requires an efficient acquisition procedure. In the case of the human cognitive system, that procedure involves borrowing and reorganising information from the long-term store of other individuals by imitating what they do, listening to what they say and reading what they write. The information obtained is combined with previous information resulting in reorganisation. Findings based on cognitive load theory provide evidence for the importance of the borrowing and reorganising principle (e.g. Sweller, 2003, 2004). How cognitive load theory suggests instruction should be organised to facilitate the borrowing of information is discussed below. During sexual reproduction, evolution by natural selection uses the borrowing and reorganising principle to allow a genome to acquire large amounts of information that is necessarily reorganised during the process.